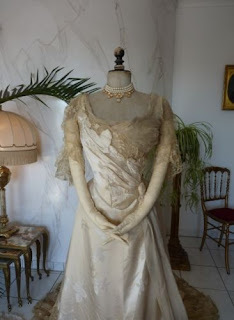 All The Pretty Dresses: Edwardian Evening Gown in Cream by Worth! 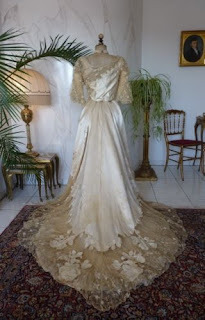 Edwardian Evening Gown in Cream by Worth! 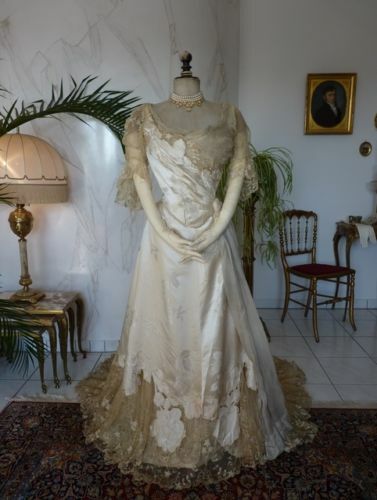 Exceptional two piece evening gown, made of cream brocade silk, tulle and lace, ca. 1898. Woven petersham: “Worth, Paris”. Number: P 8804. 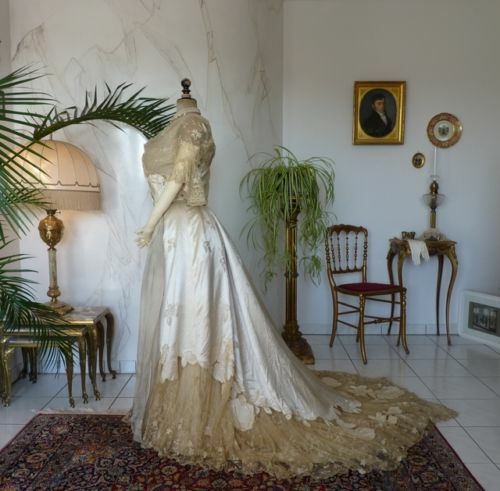 Property deaccessioned by The Museum of Early Southern Decorative Arts (MESDA), to benefit the collections and acquisitions funds. 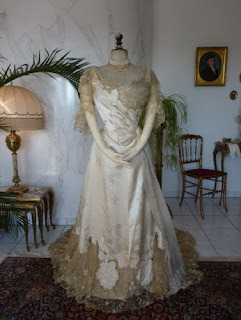 Hand written notice: „Evening Dress, Miss L.S. Drayer, worn about 1898“. Front pleated bodice with long tulle applications on a suggested belt. 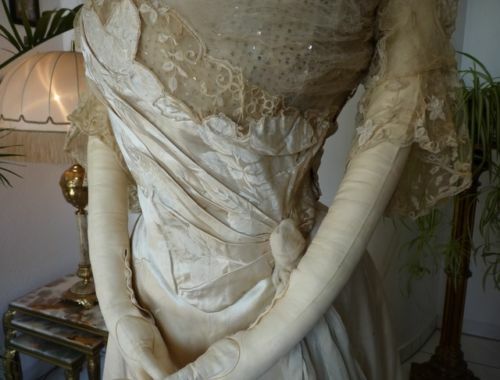 ½ sleeves made of lace. 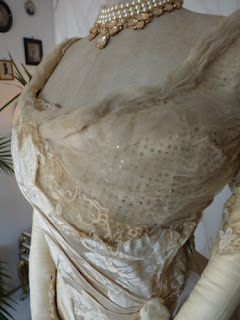 Tulle applications on the necklace and on the chest. Sequins embroideries in the chest area. Back closure with laces. Over the lacing a closure with hooks and eyes. 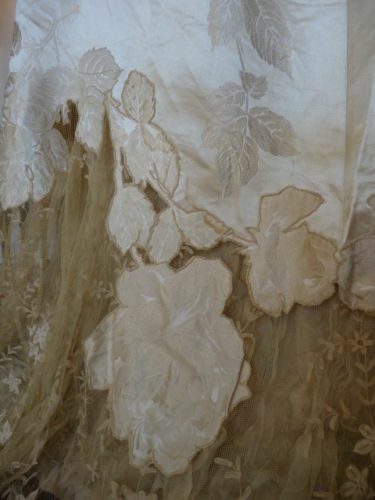 Skirt with silk floral boarder, lace and floral embroidered lace. Long train. Very good condition. 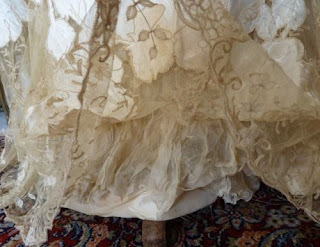 Stain on tulle and on front of the bodice. 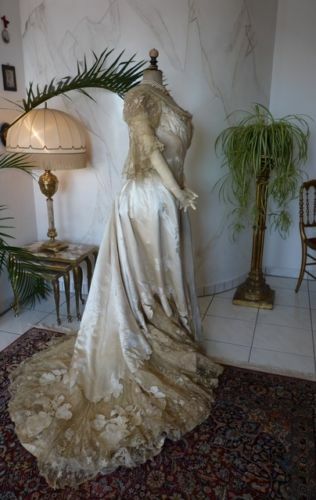 Stain on skirt on brocade on back. Old dirt. You’ll barely notice. 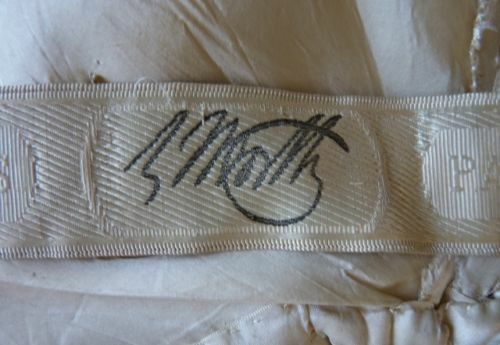 The original laces are fragil and torn. The decoration is not included. I doubt this is from 1898. 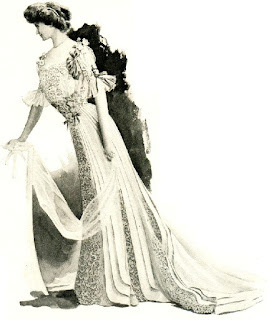 1898 they were still having a last gasp of puffed sleeves with just a hit of puff at the shoulder. Rather, the fitted elbow length sleeve with flare around the cuff is much more in tune with the 1901/1902 time frame. 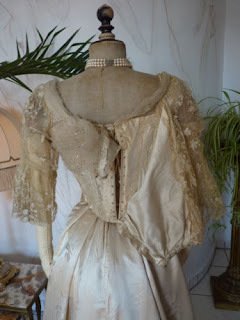 Beautiful Bustle Era Dolman Mantle!